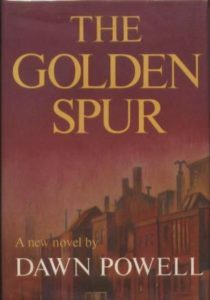 The latest addition to my website is Dawn Powell‘s The Golden Spur. This is another very witty novel from Powell – her final novel – set, of course in New York (in 1955), centred around a watering hole (the eponymous Golden Spur) and about a naive young man – Jonathan Jaimison – from the provinces (Ohio). His mother (now dead) had spent some time in New York more than twenty-five years ago, as a typist for various writers, and he has just learned from his aunt, his mother’s sister, that his mother returned from New York to marry Jonathan’s father, already pregnant. Jonathan’s mission in New York is to try and find his biological father. He soon has several candidates, based both on his mother’s friends but also his own preferences for a father. We follow his time in New York, his search for a father and his effect, invariably positive, on the various people he meets.